Normal olfactory (smell) and gustatory (taste) functioning plays a major role in nutrition and food preference and thus is important for the maintenance of a good quality of life. Smell and taste are closely inter-related. An impairment of the function of one sense can affect the function of the other. Complaints of gustatory loss, however, usually reflect smell rather than taste dysfunction. Deficits in these senses not only can reduce the pleasure and comfort from food but can also lead to food poisoning or over-exposure to environmentally hazardous agents that are otherwise detectable by smell and taste. 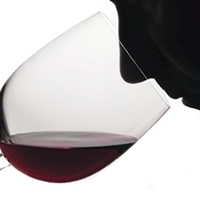 More than two million Americans suffer from smell and taste disorders. 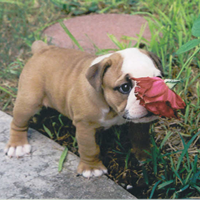 Olfactory dysfunction is more common than gustatory dysfunction because of the vulnerability and anatomical distinctiveness of the olfactory system. In addition, a decline in olfactory function is part of the normal aging process. 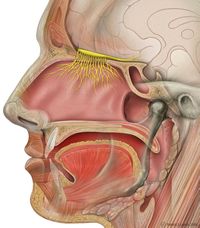 Common olfactory and gustatory disturbances could be the consequence of a variety of medications, upper respiratory infections, nasal and paranasal sinus diseases, depression, hypothyroidism, and damage to peripheral nerves supplying smell and taste. Inflammation (nasal and sinus disease), viral infection, and head trauma are the most frequent causes of smell disorders. Oral and perioral infections (e.g. gingivitis and candidiasis), oral appliances (e.g. dentures and filling materials), dental procedures and Bell’s Palsy are the most common causes of taste disorders. 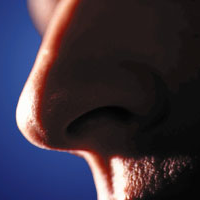 Anosmia refers to the absence of the smell sensation; hyposmia is defined as reduced sensitivity to odorants (odor stimuli), and dysosmia refers to an altered perception of smell. Dysosmia can be further classified into phantosmia (a perception of an odor without the stimulus present) and paraosmia or troposmia (an altered perception of an odor with a stimulus present). Ageusia refers to an absence of the taste sensation; hypogeusia is defined as reduced sensitivity to tastants (taste stimuli), and dysgeusia refers to an altered perception to taste with or without the presence of a tastant. Every effort has been made to ensure the accuracy and completeness of the information and documents on this Web site. However, OEI makes no warranties, expressed or implied, regarding errors or omissions and assumes no legal liability or responsibility for the use of the information contained herein or links to other Web sites and documents.